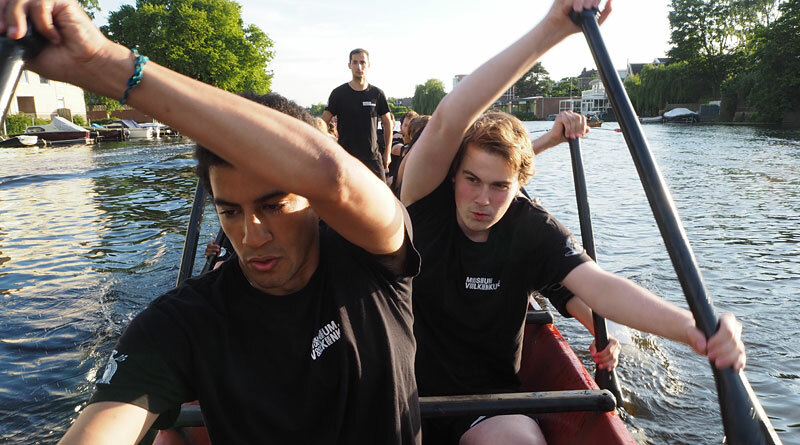 What makes a group of students in Holland so passionate about Māori culture — kaupapa waka especially — that they’re willing to travel halfway around the world to take part in Waitangi Day festivities, year after year? And how did a small Dutch city end up with Europe’s only Māori ceremonial canoe? I joined a training session on a canal to find out. Among the hundreds of paddlers taking part in Waitangi Day festivities in the Bay of Islands on February 6, half a dozen will stand out from the others. 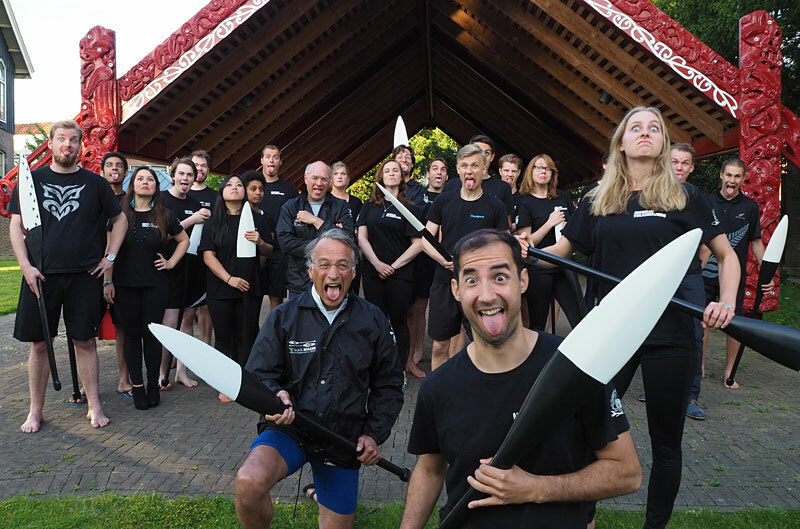 They’ll paddle with as much commitment as the others, they’ll know the chants and commands, and chances are they’ll be called on to perform their own haka when the waka (canoe) fleet lands on the beach in front of Te Tii Marae. The difference is, these paddlers will be fair-haired and pale-skinned. Their mother tongue won’t be Māori or even English but a language born of a cold northern climate. 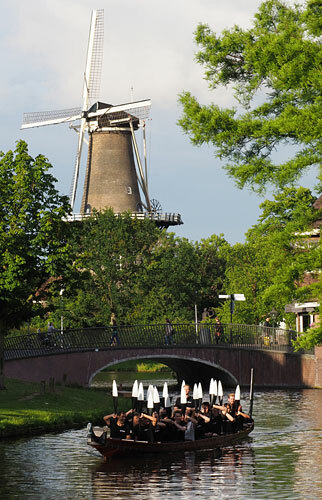 And in normal life these paddlers will be students at the University of Leiden, a small city in the Netherlands between Amsterdam and The Hague. These members of the Njord Royal Student Rowing Club’s waka group meet every Wednesday evening to practise paddle drills, waiata (songs) and haka. If the canals aren’t frozen they’ll take their waka for a spin, and every year a few come to Waitangi to hone their skills and deepen their knowledge. The story of how a city in Holland came to have a waka taua (war canoe) began in 2002 when Te Papa, New Zealand’s national museum, requested the repatriation of a mokomokai — a preserved Maori head — from Museum Volkenkunde, the Dutch national ethnology museum in Leiden. The three-year-long process of returning the head fuelled Dutch interest in tikanga Māori (Māori customs) and led to a close relationship with Te Papa. A year after the head’s return in 2005, an exhibition of photos by Ans Westra, born in Leiden but best known for her 1960s portraits of rural Māori, led to more contacts with New Zealand and the idea of “ordering” a waka taua as a living exhibit. What had seemed a museum director’s unlikely dream became reality in 2010 thanks to a €425,000 (NZ$760,000) grant from the Dutch equivalent of the Lottery Board. It also meant the museum could expand its wishlist to include a fibreglass-hulled waka tētē (training canoe) and a carved whare waka (canoe shelter) for the museum grounds. The waka was built by master navigator Hekenukumai Busby at his workshop in Aurere, Doubtless Bay, and designed for Dutch conditions with a lowered taurapa (sternpost) to fit under low bridges and a hull designed for manoeuvring on narrow canals. The waka was given the name Te Hono ki Aotearoa (The Link to New Zealand) and handed over in an elaborate ceremony as thousands of spectators lined Leiden’s canals. Arts organisation Toi Māori Aotearoa, which brokered the deal, set a number of conditions. They included that Toi Māori would retain ownership of the waka, though it would be on permanent loan to the Netherlands, and that the museum would recruit a crew to be trained in waka protocols so Te Hono could be paddled at special occasions around Europe. Some of these kaihoe (paddlers) would have to travel to New Zealand every year to keep the relationship alive. Museum curators began their search for home-grown kaihoe at the nearby university rowing club. The students were quick to embrace kaupapa waka and surprised many involved in the project with their dedication. 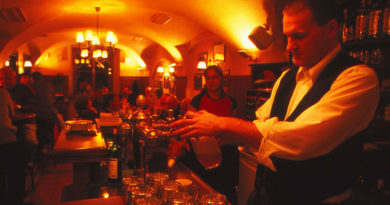 The club’s Waka Gezelschap (waka group) now has more than 60 members. 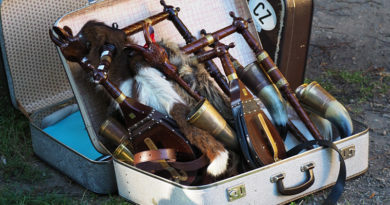 So what makes Māori culture so appealing to students on the other side of the world? Their answers vary from those who see paddling the waka as a real-life course in cultural anthropology to those who enjoy the masculinity of the haka. 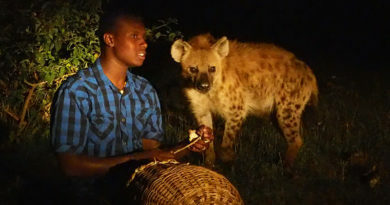 Others say they want to experience a culture in which the group matters more than the individual. Political science student Pelle Meurink, 21, took his rowing coach’s advice to go to a practice night and was amazed by the paddlers’ commitment to a culture that wasn’t theirs. “I was captivated by the Māori culture. The appeal is the discipline, the feeling of a group working together. That’s lacking in Dutch culture nowadays, everyone’s very individualistic. This is like family,” he said. Cultural anthropology student Eliza Jordaan, 20, said she knew about haka, pūkana and tā moko when she joined the group two years ago, but didn’t know what a waka or a marae was. She was not pretending to be Māori or trying to appropriate another culture. The annual exchange between the Netherlands and New Zealand is managed by Ngā Waka Federation, which is chaired by Robert Gabel of Kawakawa. Every year more than 400 kaihoe, including the Dutch students, take part in a training camp at Haruru Falls in the Bay of Islands, culminating in the February 6 Waitangi Day waka display and mass haka on Ti Beach. Mr Gabel said the Dutch paddlers had been taught waka protocols as handed down by ancestors and kaumātua. 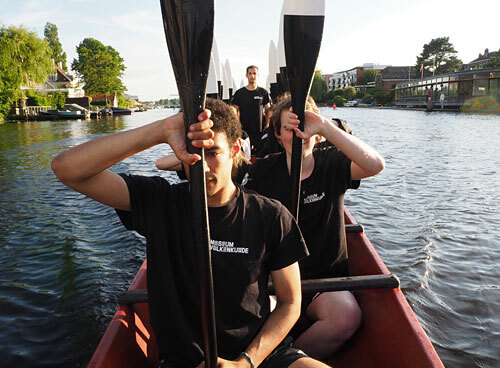 On training nights in Holland the students use the waka tētē they named Tāhimana, after the Dutch explorer Abel Tasman. Te Hono ki Aotearoa, which weighs just under a tonne and may be paddled only by men, is used only on special occasions. The Dutch kaihoe practise a move called wanawana (“the swan”). In 2012 Dutch students joined the London-based cultural group Ngāti Rānana as they paddled Te Hono down the River Thames as part of a pageant celebrating the Queen’s Diamond Jubilee. That same year they paddled it on the River Main as part of the Frankfurt Book Fair in Germany. 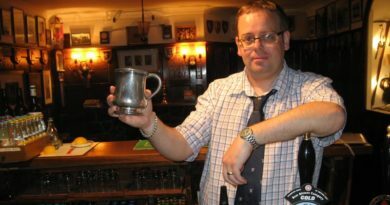 Statistics student Michael van Gestel, 27, was part of the Frankfurt crew. It was the “warrior aspect” of Māori culture, the haka especially, that drew him in. For others, such as Thijs Lubberman, a burly All Blacks fan who plays rugby for Leiden University, the attraction is spiritual. The following is a first-person piece I wrote for the Northern Advocate about the strangeness of seeing something as quintessentially Māori as a waka, but on a Dutch canal instead of a New Zealand waterway. When you’re a New Zealander abroad few things evoke home as powerfully — or make the hair on the back of your neck stand up quite as much — as the sound of the haka. The same goes for the sight of a waka propelled through the water by a crew of chanting warriors. So watching a haka of spine-tingling intensity in a genteel country like the Netherlands, or gliding past windmills and centuries-old buildings in a waka, was incredibly disorienting. For a while I wasn’t quite sure where I was. I knew about the Dutch waka group from their annual visits to Waitangi and I’d followed the building of Te Hono ki Aotearoa at Hec Busby’s workshop in 2010. Waka and windmill: A strange juxtaposition. So when I visited the Netherlands last year I had to go to Leiden — which also happens to my father’s birthplace — and invite myself along to a training night. 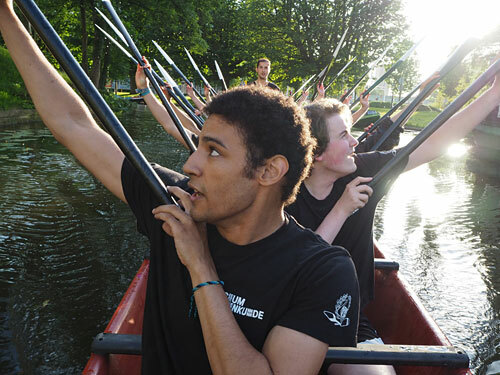 The Njord Royal Student Rowing Club’s waka group meets every Wednesday evening in the grounds of Museum Volkenkunde, the Dutch national ethnology museum, where the ceremonial waka Te Hono ki Aotearoa is based. I was given a warm welcome and invited inside to join the opening karakia (prayer) led by medical student Thomas Driessen. 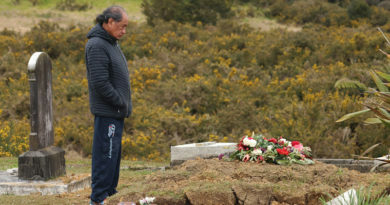 Thomas is a two-time veteran of Waitangi Day and his pronunciation of te reo (the Māori language) would put most Pākehā New Zealanders to shame. It probably helps that everyone in the Netherlands is fluent in at least two languages. After a series of paddle drills on land, led by the more experienced members of the group, it was time for the real thing. Waka training is done in the fibreglass-hulled Tāhimana because it can be paddled by men and women, but also because getting the one-tonne Te Hono out of its whare and onto the water is a major exercise. I had another moment of disorientation watching the waka power away from the museum jetty to the familiar chant of “tōkihi, tōkihi” — down a narrow canal lined by brick apartment buildings and an 18th century windmill. While the paddlers followed the canals to the rowing club’s headquarters on the other side of town I got a ride on the back of a bicycle through a maze of bumpy cobbled streets. There English literature student Alex Miesen, another Waitangi veteran, took over as kaihautū (captain) and I was invited on board for a paddle. The trouble was, the only way I could get the photo I wanted of the crew in action was by perching high on the bow and facing backwards. That made the waka disturbingly wobbly but I got a few good shots, then asked to be dropped back at the embankment. And so I teetered on the bow down a river, through canals lined by house boats and past more windmills, partly terrified (not by the prospect of an unscheduled swim but because I was holding a brand-new camera) and partly exhilarated as the waka sliced through the water at a surprising pace, the paddlers’ chants only interrupted by shouts of “head down!” whenever a low bridge loomed ahead. I was buzzing and, thankfully, my camera was still dry when we made it back to the museum. The students ended training night with haka practice — the ka mate version and their own, composed especially for the Dutch waka by Toi Māori, winning applause from the balconies of nearby apartments — and a closing karakia. And then it was time to reconvene in a bar across the road to talk about waka and the group’s upcoming trip to Waitangi.